SpeedRunners is an overlooked gem that demonstrates exactly how Steam’s Early Access platform should work. In this updated preview, we’re taking a look at the game’s latest update, “Rise of the Falcon”, as well as other major changes to the game, to see if SpeedRunners is still way ahead of the competition. 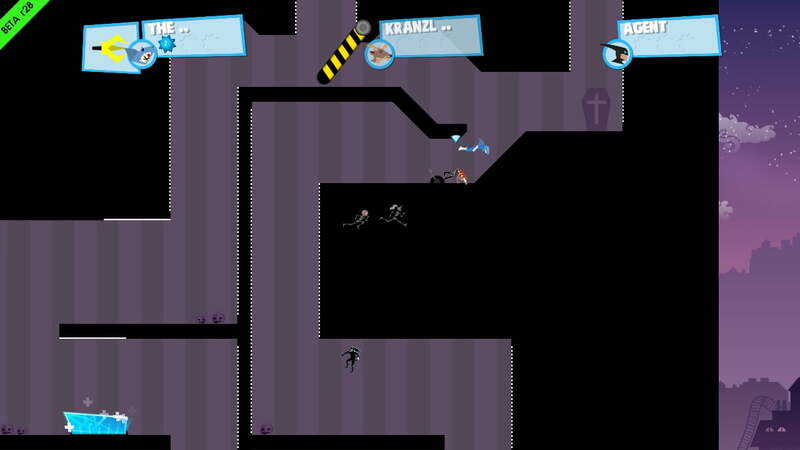 I bring up SpeedRunners an awful lot in my coverage of Early Access games. It was the first of said games I previewed for GIZORAMA, and it conveniently set a benchmark for exactly how Steam’s oft maligned platform should work. 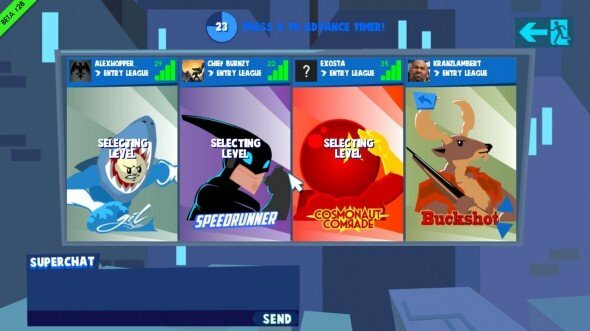 Simply put, SpeedRunners was a great multiplayer game that needed fleshing out; it had a few levels, a few playable characters and a few weapons, but the game’s core concept and gameplay was so fantastic that I still managed to squeeze a reasonable amount of gameplay out of such an early alpha build. What did the game need? Well there was little available in the way of single player modes, and the meagre number of levels and characters prevented the SpeedRunners from being truly exceptional. All of these features have been added and tweaked to near-perfection, making SpeedRunners as intense and addictive as ever. I was originally supposed to cover the game’s new update “Rise of the Falcon” (free to anyone who owns the game in Early Access) as a review, but I felt somewhat dishonest providing a full review for a game that isn’t yet finished. Still, I will cover said update as a finished product in of itself, whilst also updating my original preview of the vanilla game (if you want a general overview of the game itself, I suggest you go read that first). As labyrinthine as each level first seems, they’re surprisingly easy to grasp. The update itself brings four new characters and five new stages. SpeedRunner has managed to piss off an overweight chicken farmer known as The Falcon, who has assembled a rival team of costumed heroes/villains(? ), namely: Gil, a man in a shark suit who does the worm when inanimate, The Falcon himself, who’s animations never failed to crack me up, Manekineko, a Japanese lucky cat whose “motivations are unclear” and my personal favourite, Buckshot, a buck with a shotgun. As before, these character designs are all immensely entertaining, and add even more colour and variety to the world of New Rush city. The new stages are very well designed, too, and offer more challenging experiences for journeyman players, thanks to the addition of more traps, levers, doors, grapple points and weapon pickups. 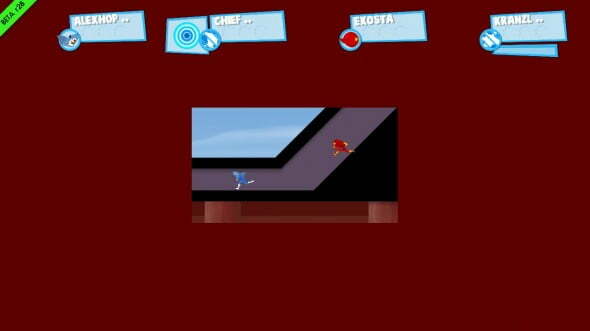 Essentially, Rise of the Falcon is more of what made SpeedRunners great in the first place. Races are still frantic, fast-paced and thrilling, only now there’s more variety when choosing characters and stages. I’m not saying I lost most races, but I’m not saying I won many either. Elsewhere, the original game has come a long way too. There is now a single player time trial mode known as “Origins”, which details SpeedRunner’s back-story. This mode was a welcome addition, as it opens up a whole new avenue of play for anyone who avoids multiplayer gaming or doesn’t have a reliable internet connection. Missions in origins are fairly short and sweet, but they do a good job of teaching you the basics of running, jumping, and swinging through different situations, and handy tool that means no one need be a novice when they step up to multiplayer matches. Another interesting new feature is the presence of the King of Speed wheel which appears at the outset of randomly selected matches, and assigns random effects to said match. Most of these effects involve weapon pickups (e.g. restricting weapon pickups to grapple hooks only etc. ), but they help to keep games varied and players on their toes. My personal favourite was: “All pickups are rockets, and you get three!”, which is about as insane and nonsensical as it sounds. When a race has gone on for too long, the screen begins to shrink and the race becomes even tighter. The whole SpeedRunners experience is more enjoyable this time around simply because the game now has a small but dedicated multiplayer following, meaning it’s never difficult too find ranked or quick matches. You can also jump into a game mid-match, which is a handy way of keeping matches flowing when someone rage quits or loses connection. Oddly enough though, the increase in the availability of online matches has shed light on a few problems with SpeedRunners. Matchmaking lobbies are needlessly confusing – it’s never clear who is selecting stages or whether you need to hover over a stage to choose it, or press A/X on it and override everyone else’s choice. Although actual races are best experienced with a controller, the same cannot be said for the game’s menus, which are strange and unweildy with a 360 pad. There’s also the unfortunate issue of internet connections to consider. On more than one occasion, a match I was in would glitch beyond reparation; players would be eliminated for being too far ahead, barriers that were meant to be open would remain shut, rendering the entire level unplayable, and there were even moments where sprites would fly away and vanish from the screen for no reason. These moments were rare – my fellow players and I shared comments of “Wow, I’ve never played such a glitchy match before – but they did mar my experience slightly. I guess it’s lucky that the game isn’t finished yet. Each character is a wonderful pastiche of Silver Age Comics designs. 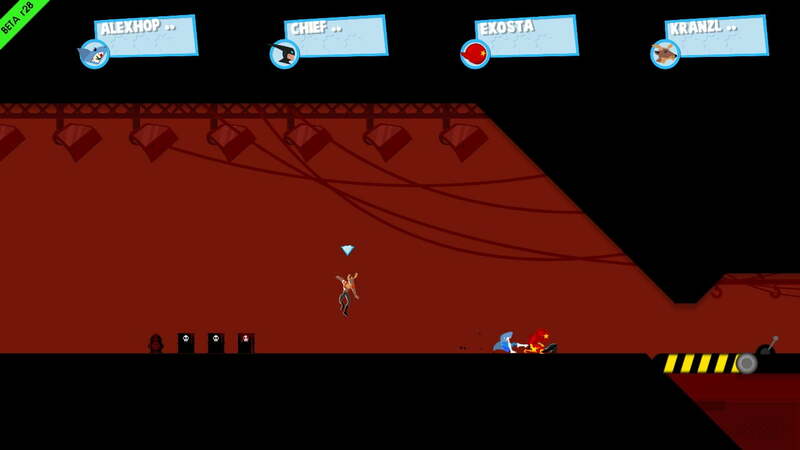 On the whole though, SpeedRunners is more intense and engaging than ever. Each game (that works) is a fast paced and ultra-competitive Mario Kart-esque romp that will have you screaming in both frustration and delight. There are still some issues with matchmaking and menus that need fixing, but the core SpeedRunners experience is still as fun as ever. There has never been a better time to step into New Rush City.